Len Killeen was an exceptional left winger and a very accomplished goal kicker especially when the pressure was onThe outstanding example of that was at Wembley in 1966, when his St Helens side were awarded an early penalty in the Challenge Cup final against Wigan. The ball was well inside Saints' half – their forward, Ray French, in his account of the game estimates it, with the angle, at 65 yards – but Killeen kicked the goal without fuss. Killeen had scored a spectacular interception try to beat Dewsbury in the semi-final. He crossed the try-line again in the final, scooping up a grubber kick from Billy Benyon. In all, he scored 13 points and was awarded the Lance Todd Trophy as the man of the match in a21-2 victory in front of a record 98,536 crowd. He landed another remarkable kick from the touchline and was narrowly off-target with one from all of 70 yards – and this at a stadium where swirling winds were popularly supposed to make goal-kicking particularly difficult.Killeen, whose kicking that day was described as "nonchalant", was undoubtedly the key figure in a one-sided final, although he hardly received a pass. 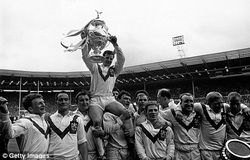 He was the first and so far only South African to win the Lance Todd, only the second overseas player and the first winger.With another South African, Tom Van Vollenhoven, on the other wing, St Helens won four trophies that season. Although Killeen never quite enjoyed the larger-than-life reputation of "The Van" he was a match-winner in his own right, with tremendous pace and handling ability.He was already well-known in his home country for his exploits in both rugby and basketball when he was spotted by a St Helens scout in South Africa playing for his local club, Uitenhage, in 1962. Although he was only at Saints for five full seasons, his scoring record for them was quite exceptional. His magical season was 1965-66, when he became the only player to top the scoring tables in all three categories: tries (32); goals (120) and points (336). He was leading point-scorer three seasons running and in all accumulated 1,160 points from 115 tries and 408 goals. He had his own, distinctive method, standing the ball upright and taking only a token run-up, and such was the range and accuracy of his goal-kicking that he had offers from American football. Rather than that, however, he took up an offer in 1967 to play rugby league in Australia. He signed for the Sydney club, Balmain, and in 1969 he was a member of the side that won the Premiership. That season, he established a new club point-scoring record of 207. In the Grand Final, a surprise 11-2 win over the hot favourites, South Sydney, he was on target again, with two goals, plus two drop-goals from another import from England, Dave Bolton. Killeen played for the Balmain Tigers until 1971, finishing with 664 points, before having one last season with Penrith and retiring and returning to South Africa. His status in both hemispheres is underlined by his dual distinction of membership of both the St Helens and Balmain (now Wests Tigers) Halls of Fame.